“One of our readers has sent us this photo which was taken in 1979 at Stanford Hall during a Wolseley rally. But then we looked better and found that directly behind the doors the body is different. 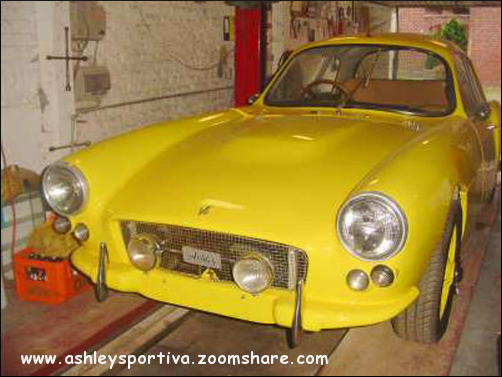 So we started to Google at Warwick, Peerless, Gordon Keeble and early TVR, but all to no avail. So we put the question to you. Perhaps you were there at Stanford Hall in 1979 and can tell us what this is”? 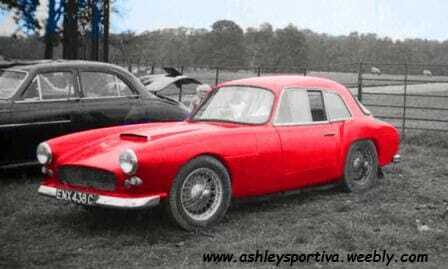 After a few suggestions the members came up with the correct answer which is of course a 1965 Registered Ashley Sportiva Colour RED. 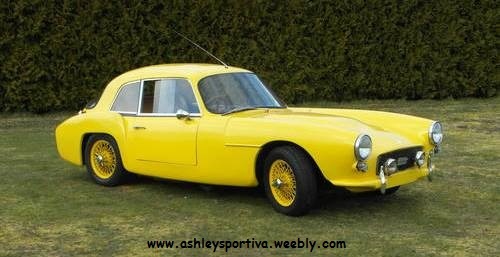 I noticed that one member checked with the DVLA and found it was still registered as "ENX 438 C" and named as an "AshleyPheonix". 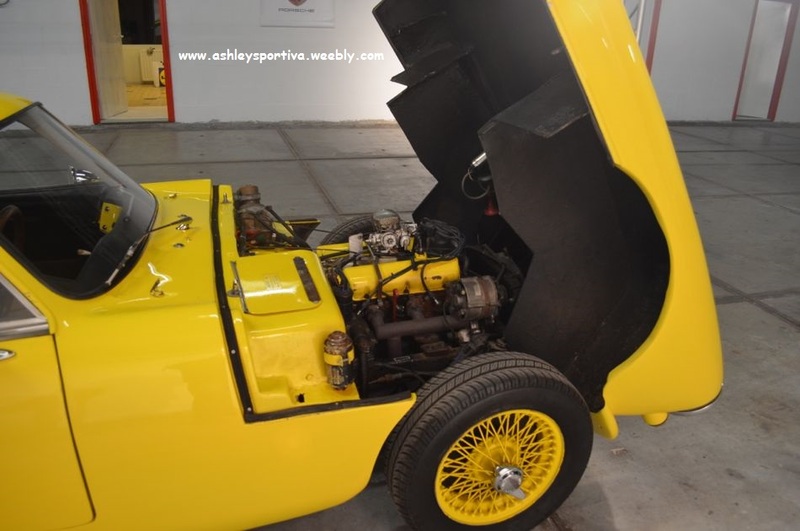 The Advert stated "This car was totally restored a few years ago and is still in perfect condition, with original rebuilt Ford V6 engine. 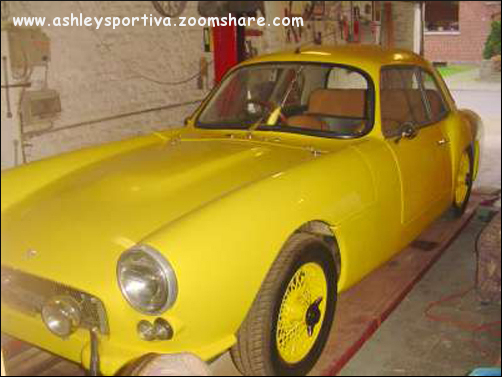 Very rare UK make, only 72 ex. RHD. 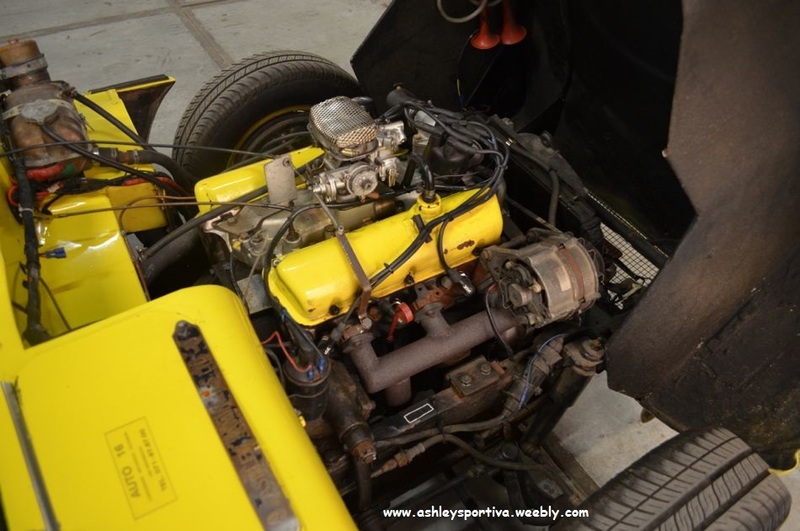 Ideal for racing, hill-climb, stop&go, slalom, rallies, very competitive with Ford 4 speed box and MGB short ratio axle. Spoke wheels. 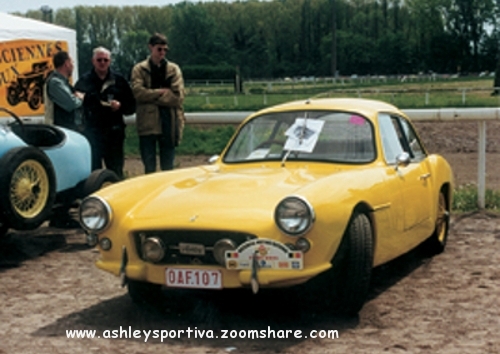 Belgian registration. Car is located near Brussels". (It must have been too highly priced and not sold in June). But wait, here it is again. Then along comes this, yet another article on the internet. (Don’t you just love it)? 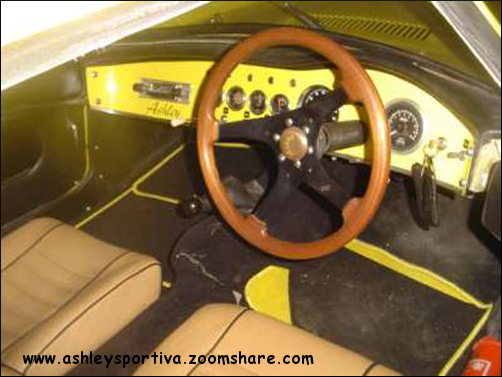 I do not know if it will be useful for you this information, but I inform you that the Ashley ENX 438C was on sale in the Salon Autoretro in Barcelona, Tuesday 7th December. My ignorance of the mark was total and seeing your website I could find out many things about this vehicle. 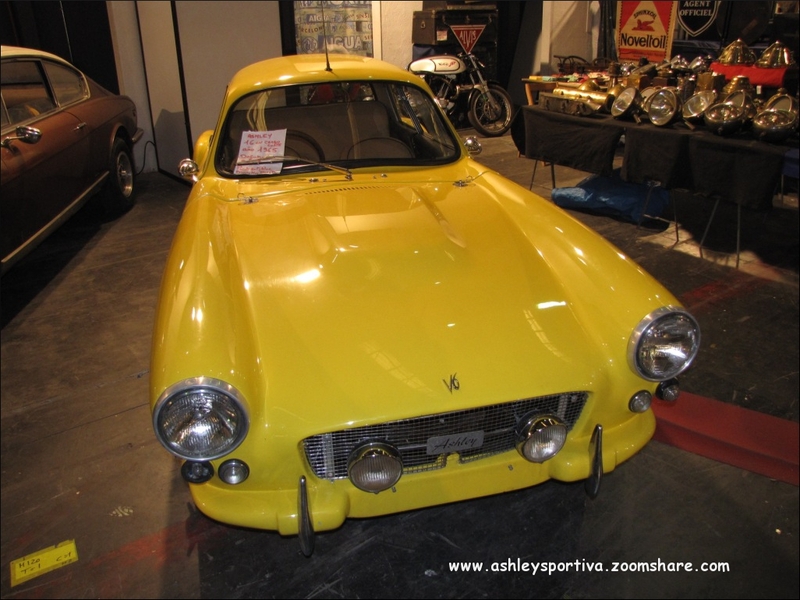 Congratulations on the web which is very useful for car enthusiasts. On careful inspection of the Belgium advert pictures you can see that for some reason the number on the rear registration plate has been painted out. (using Paintshop or equivalent software). 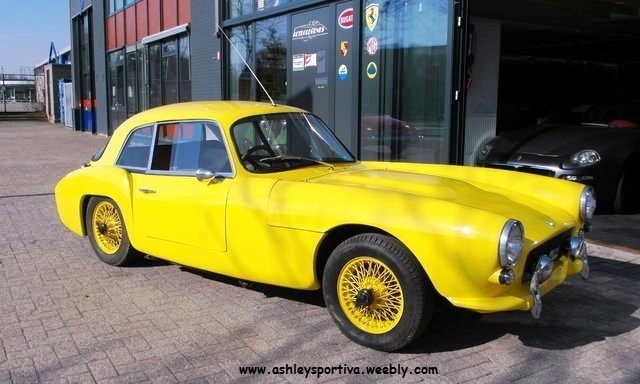 It’s the same car as in Belgium and upon further inspection of the rear view the registration plate number is "ENX 438 C" so the Ashley/Phoenix rises again, not in UK now, but in Belgium and then Spain. (I wonder where it is now)? The car is definitely the same car in all 4 places, there has been some modification work on the bonnet to fit the larger V6 engine presumably, but it is the same car. 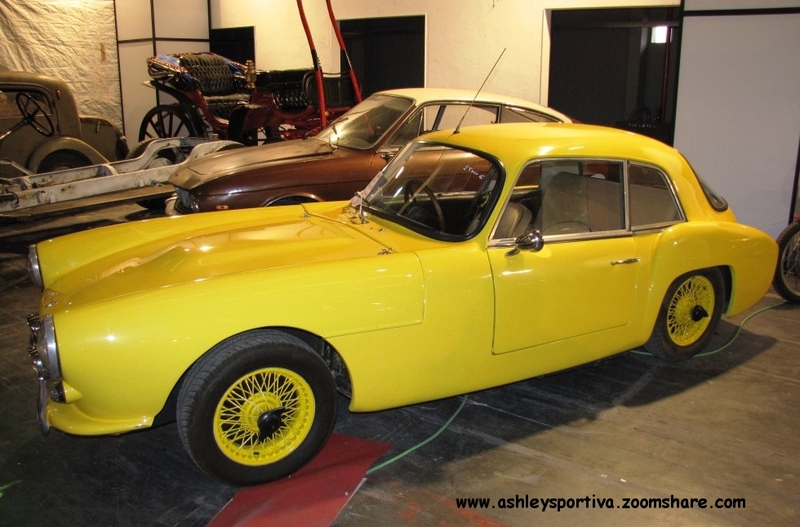 Wire wheels with spinners (now yellow), side lights in same position (additional light fitted on outside of indicator light and of course the same Rego Number and plates. If anyone knows the current owner I would be interested in contacting them for further information and an update on the cars whereabouts. 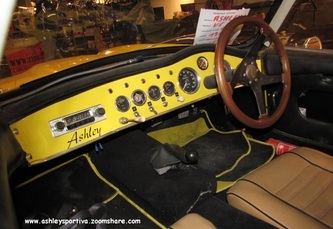 On 18th November 2012 I received an email from Jean Christophe from Belgium informing me that an Ashley Sportiva was for auction in France on the 1st December 2012 and included an internet link to the auction site. 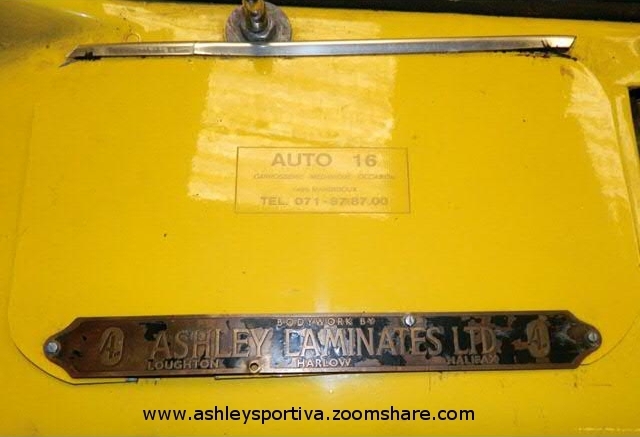 It showed an "Ashley Laminates Ltd" nameplate on a yellow section of bodywork. 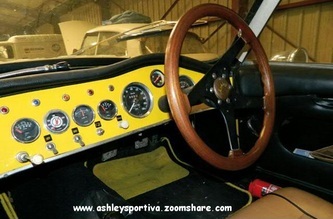 I replied asking for photo's and more information about the car as I suspected it could be ENX 438C. He was able to supply another link which included photo's that confirmed my suspicions that ENX 438C was on the market again. I emailed the auctioneer for information but have not had any reply unfortunately. Jean Christophe is trying to get more information for me, he knew the owner 10 years ago and lived near to him in Charleroi, Belgium. 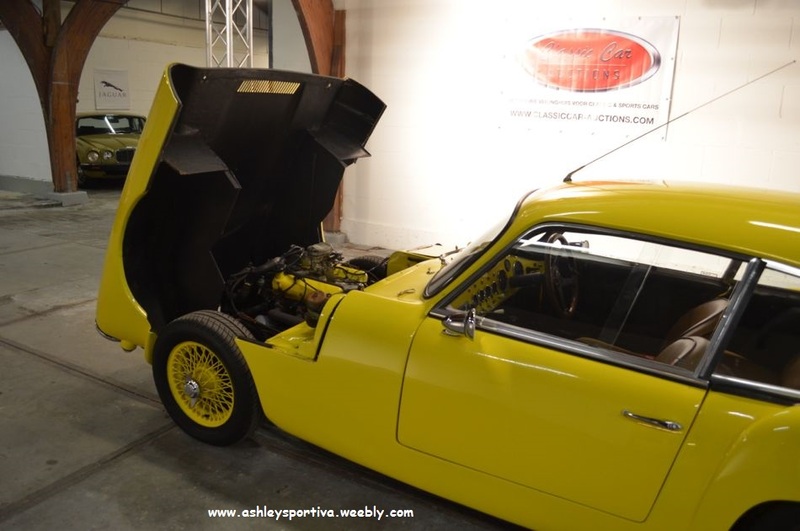 If anyone attended the auction and knows the new buyer please pass on this website and email address to them, as I would be very pleased to hear from them and learn more about the car and follow it's progress. 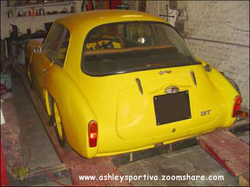 I note that it has been re-registered in UK as of the 13th December 2012 for 12 months. Time moves on and so it seems does this Ashley Sportiva. 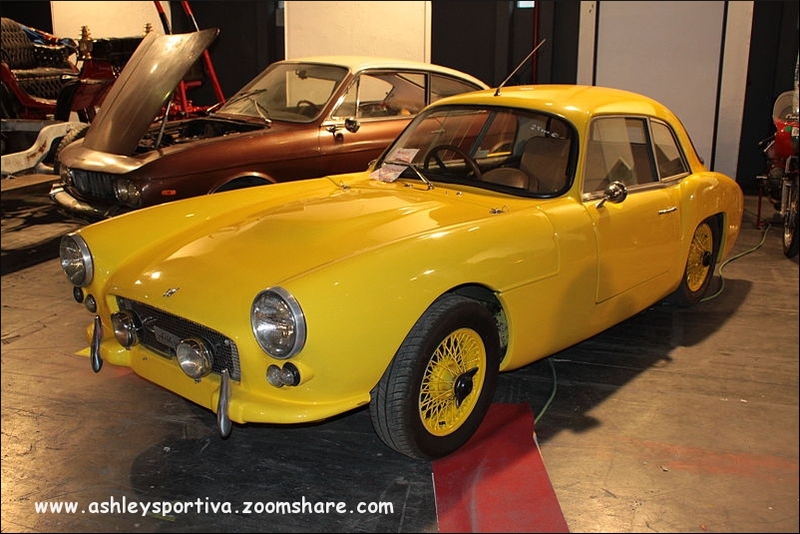 Seen this time on a number of Websites selling Classic Cars this time it's For Sale at Retrolegends in Valkenswaard, Netherlands. 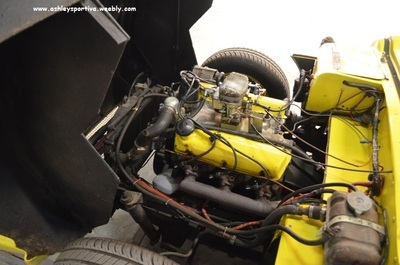 Below are more photo's courtesy of Retrolegends, unfortunately none under the Bonnet showing the Ford 3000cc V6 engine and how it's fitted. Once again the Ashley Sportiva appears on the internet, this time at Classic Car Auctions in the online auction house of the Netherlands. I had quite a few emails from different viewers to my website informing me of it's appearance at the online auction site. 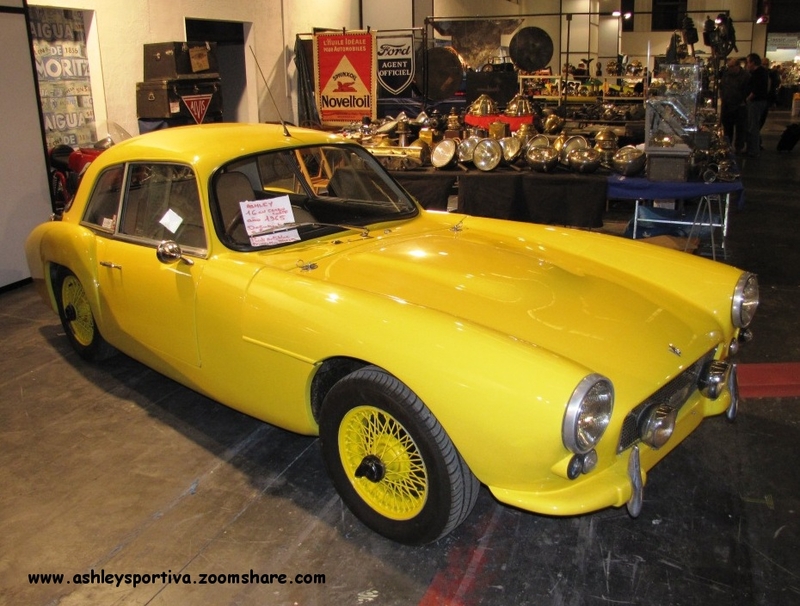 As far as I can make out it had a starting price of € 14.500 but it had not sold by the end of the auction period. 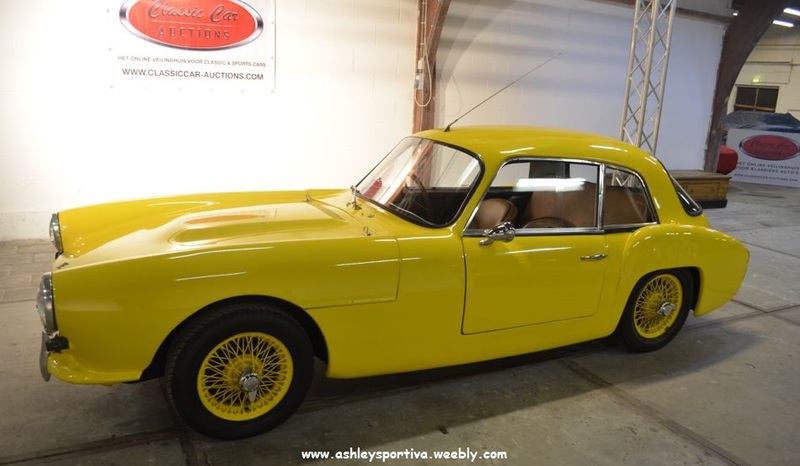 Attempts to contact the auction site by email were ignored as I had no response to any of them, so I have no idea what happened to the car after the auction finished. So what happens to it now, I'll just have to keep looking through the internet and hope it turns up again. At least this time the photographer opened up the bonnet and took a few photo's of the engine and engine bay so that we finally get a look at it. 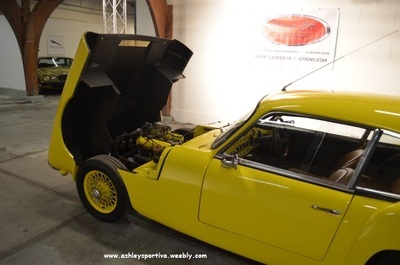 Below are a few more photo's from the auction. Well it's now 2014 and the Ashley has shown up again this time For Sale again at Retrolegends in Valkenswaard, Netherlands, maybe it never really left their ownership. 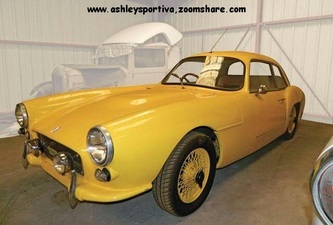 that goes for any other Ashley Sports Cars also, Thanks.